Many people said it wouldn't happen, but George Lucas finally decided to sell his company to the Mouse (listen to the conference call here). And now that that has happened, many others will be invited to play in his sandbox. We can expect to see a great deal of news in the coming months as the writers of "Episode VII" are revealed, as a director is chosen, and as the start of production nears. The film is only one part of this. Star Wars is not just a film, but an entire ecosystem of possibilities. From film to television to merchandise, there are literally worlds to explore with this property. 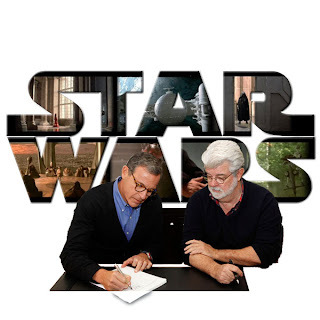 And remember that Iger and crew bought Lucasfilm, not just Star Wars. Naturally, that was its biggest jewel, but not its only one. Indiana Jones is right behind it (Mr. Dini, call your agent and set up that meeting for the Indiana Jones animated series). Then there are all the other lesser known properties, and all the umbrella corporations that make up the company. Industrial Light and Magic at the Letterman Digital Arts Center, Skywalker Sound at Skywalker Ranch, and the animation facilities in Singapore, and on, and on. I don't get it, project valor? This has been expected for a long time.. I'm actually very curious to see what they'll do with Skywalker Sound and Industrial Light and Magic. There is a reason that these two entities were private businesses before and not owned by a major studio. There is a reason that no major studio owns it's own visual effects house (other than SPI). Will Disney keep these two businesses in house, or spin them off into their own companies? Seriously, do fan boy's think this makes a positive difference in the whole "you wrecked my childhood" thing? If anything, they should be more furious. It's been clearly laid out in the few press videos and write ups that this is clearly a money making venture. More movies (not just episode 7, 8, 9), but spin off's, television shows, comic books, toys, theme park attractions. This is not "Help me Disney, you're my only hope," This is DI$NEY going for another franchise to make them a buck, with the expectation fan boys will follow like a group of lemmings. I ditched STAR WARS after episode 1 and without an Act of God, this franchise will never regain it's integrity. I don't get it, project valor?" That was Disney's code name for the project until the announcement. I think Honor knows more than he's letting on. Hollywood is in business to make money. Always has been. Always will be. Since they're under the Disney umbrella, I'm finally okay with Star Wars and Indy attractions in Disneyland.